Have you ever traveled someplace new and been just as excited about trying the local cuisine as you were about seeing the sights? If you’re anything like me, your answer would have, of course, been yes. To be entirely honest, sometimes I’m more excited about a destination’s dining options than I am about the destination itself. During spring break, I took my first ever trip to California. And obviously, I made sure to eat avocado toast, Chinese food and I went to see what the hype about In-N-Out is all about. I stopped at multiple coffee shops and paid a pretty penny for a number of lattes and cold brews. I even made a stop at Van Leeuwen’s ice cream truck in Venice Beach and got myself a $6 cone of vegan pistachio. I’d 10/10 recommend that one, by the way. And while this was all absolutely worthwhile, what I spent the most of my time (and money) indulging in wasn’t even a California exclusive. Enter: Jamba Juice. If you’ve never heard of or been to Jamba Juice, you’re missing out. While I have nothing against any of the smoothie places in Lincoln (I’ll always love ya, nuVibe,) Jamba Juice, in my opinion, is the champion of its kind. I’m sure to stop every time I’m within an even relatively local proximity. Without a Jamba Juice location anywhere in Nebraska, and the nearest Jamba being hours away, I made sure hitting this smoothie spot was at the top of my list for this trip. During the seven day time-span of my vacation, I may or may not have made six purchases off the Jamba Juice menu. I even went as far as diverting the maps to add an additional stop when a Jamba was nearby, but not necessarily on the way to a destination. 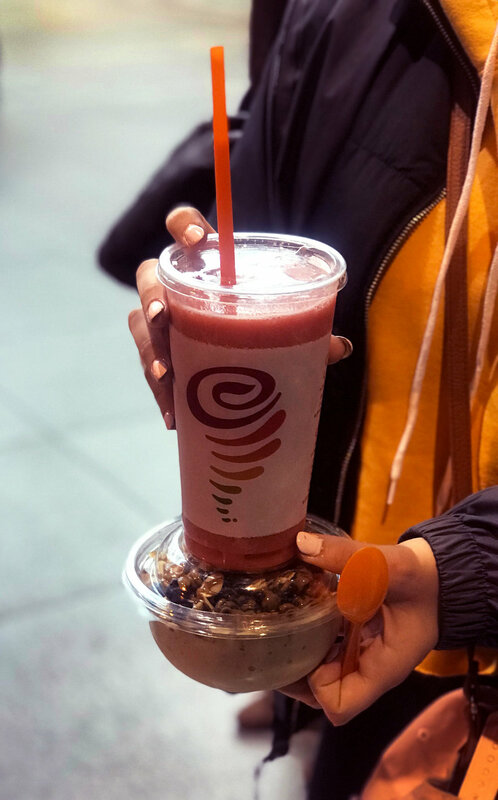 With the inclusion of menu items such as oatmeal, baked good, coffee blends, breakfast wraps and sandwiches, as well as a variety of other snacks, Jamba Juice isn’t just a smoothie shop. It’s a great place for meals, a pre or post-workout stop, a study zone and an overall cheerful environment. My personal favorites are the Pomegranate Paradise and Peach Perfection smoothies and the Nutty Almond Butter Bowl. Next time you’re in an area with a Jamba, even if it’s just an airport kiosk, try something. It’ll be just the refreshing boost you need to get you through your day.